After calling the meeting to order, Chairman Birknes advised that originally this date, December 19, was to have been the resumption of the Public Hearing on the application of Cellco Partnership d/b/a Verizon Wireless to locate a telecommunications tower off Route 302, but this was continued at the request of the applicant�s legal counsel. The new date as agreed by both the Town and Verizon Wireless is Thursday, January 25, 2007. The Board reviewed the minutes of November 2, 2006. Evan Karpf asked to make a change in the second sentence of the second paragraph on page 4 -- from �forwarded sites �� to �forwarded the ordinances and regulations of several towns on these two subjects.� Everything else being all right, Chairman Birknes entertained a MOTION to: accept the minutes as corrected. Dr. Karpf made the motion and Connie Oliver seconded. All were in favor and the minutes were approved unanimously. The next item was the discussion of the warrant articles, the first being the Lighting Ordinance. This will be submitted just as it had been two years previously. As all were familiar with this, the Chairman moved on to the next article which was the �Wetlands/Surface Water Protective Buffer Ordinance.� The Chairman advised that this will be Article XII and he had continued the numbering in line with the system already in use, along with doing some editing. Discussion ensued as to various corrections and wording changes for clarity. This has been sent to Bernie Waugh for legal opinion on content and wording which may be used for the posting of the public hearing as well as for the Warrant, Town Report and ballot. The third article for discussion was the �Ridgeline and Hillside Conservation District,� to be Article XIII of the Zoning Ordinance. Discussion regarding a topographical map took place. Maryclare was asked to contact Cartographics about a topographical overlay map of the town map �amp;quot; regarding what they would recommend and what the cost would be. Dr. Karpf will also research locating one. The height limit noted in #1304, at 1500 feet, was discussed and there was a consensus that it may have to be adjusted higher. Dr. Karpf will look into it further, particularly in Bretton Woods. While it is believed that height protection is needed, the Board wants to be sure it does not cause adverse effects. There was also discussion of where the Bethlehem town line is in Bretton Woods. At that point it was mentioned that it might be a good thing to have the Planning Boards in Carroll and Bethlehem work together for particular aspects. Article VII of the Zoning Ordinance was the next item to be discussed. Under Section 702.1, A-2, #9 must be deleted to remove any reference to the footprint of the building and/or the value of the structure, as a building permit is now required for all changes. Though this had been voted on previously and approved, it was not valid as the wording was not legal. Dates for posting and holding public hearings were announced by the Chairman and discussion ensued. It was decided, because of time constraints, that public notice would be in the �Democrat� and �Courier� newspapers for their January 3 editions, and thus the Public Hearings on all four warrant articles will be Tuesday, January 16, 2007, the last day possible. Dr. Karpf told of a very large poster showing the night sky that he may be able to borrow, and the Board encouraged him to try and get it so it can be on display at the hearing. 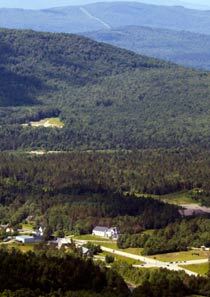 The last item was regarding the roads in the area of the Mount Madison development in Bretton Woods. John Sweeney and John Birknes met with Michael Brunetti, Director of Property of the Bretton Woods Resort Community and agreed on the roads as shown on the map being used by the Planning Board i.e. Mt. Adams (Road, Way, Lane) and Hartford Lane, which will end at Mt. Adams. The proposed Mt. Jefferson Road is currently on hold as is the extension of Hartford Lane. The roadways/driveways in the actual Mt. Madison development currently do not have names and if needed, Mount Madison . . . . . . . . would be okay. There being no other business John Sweeney made a Motion to: Adjourn the meeting and Evan Karpf seconded. This was approved unanimously. The Chairman declared the meeting ended at 8:15 p.m.